This colloquy will gather 15 deans from theological schools in the United States and Canada for two sessions to focus on the unique role and responsibility of academic deans in theological education. This focus is predicated on careful attention to emerging trends and new models of theological education for the complex 21st-century world. Set in this context, it is clear that the dean’s leadership role and responsibility is more demanding today than ever. The increasingly complex role of the dean requires, first and foremost, the unswerving capacity to be guided by educational mission, as informed by integrative theological reflection. The dean’s role also calls for exceptional communication skills to articulate this mission to a school’s diverse constituencies. providing institutional leadership for multifaceted discussion of both the potential for information technologies to enhance the educational mission and to enable multiple educational delivery systems, on one hand, and of the need for residential and hybrid learning models, given the limits of these technologies, on another hand, all the while balancing the “end game” of theological education with the interests of a school’s diverse constituencies. This colloquy is designed to provide a forum in which deans explore the overall mission of theological education, articulate new insights, reflect on their own leadership styles and best practices—in community with others engaged in the unique vocation of academic deanship in a theological school. Participants will receive a stipend of $2,500 for full participation in both sessions, plus local expenses and travel. Front Row (left to right): Rebecca Slough (Associated Mennonite Biblical Seminary), Zaida Maldonado Pérez (Asbury Theological Seminary – Florida), *Michael Jinkins (Austin Presbyterian Theological Seminary), *Melanie Duguid-May (Colgate Rochester Crozer Divinity School), José Irizarry-Mercado (Evangelical Seminary of Puerto Rico), Angela Bauer-Levesque (Episcopal Divinity School). 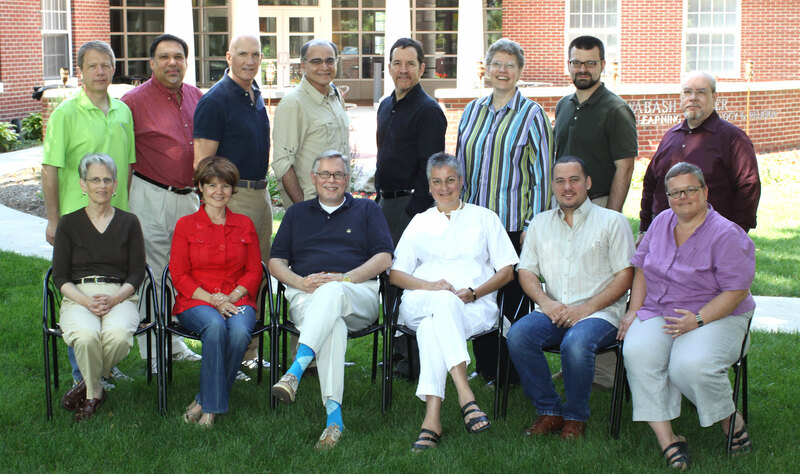 Second Row: *Paul Myhre (Wabash Center), Efrain Agosto (Hartford Seminary), James Kay (Princeton Theological Seminary), Luis Rivera Rodriguez (McCormick Theological Seminary), Mark Markuly (Seattle University), Robin Steinke (Lutheran Theological Seminary at Gettysburg), Steven Schweitzer (Bethany Theological Seminary), Israel Galindo (Baptist Theological Seminary at Richmond).